She awakes from a stasis chamber and is immediately summoned by a large machine which is losing power. It instructs June to find 4 other machines and turn them on, there by becoming a hero. The main machine providing a key. The yellow key leads to this yellow area. Heir apparent to An Underwater Adventure by Nifflas. 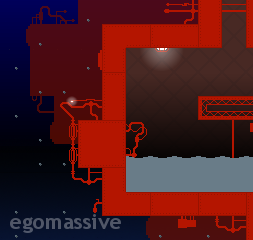 This is a level I made for a competition at the Knytt Stories forums. The rules were quite extensive, but the jist of them was to create a level about the keys. There are 4 keys in Knytt Stories in 4 colors; yellow, blue, red, and purple. Each key was to have it’s own area based on it’s color. The areas were to be found in sequence, one area unlocking the next. My level revolves around a new character, June. She awakes from a stasis chamber and is immediately summoned by a large machine which is losing power. It instructs June to find 4 other machines and turn them on, there by becoming a hero. That’s all there is to it. The main machine provides June a key to start with, and an additional key for each sub-machine she successfully activates. 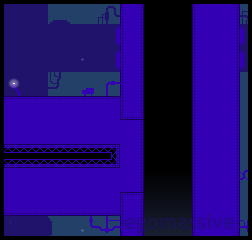 The level is not finished yet. The due date for the competition arrived so I submitted it as a demo. You can find a link to the demo below, but I recommend waiting for the finished product. I have no estimate at this time of when the level will be completed. The graphics are originals by me, Tim McDowell. The graphics are an expansion of a collection I made for a request. They are very much a derivative work based on graphics by Nifflas, the creator of Knytt Stories. 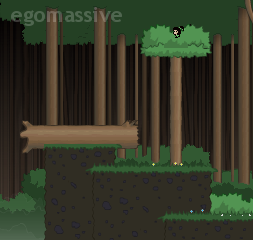 The finished level is planned to have an intro scene much like the one in my first level, A Knytt in Time. There will also be 2 endings. I also plan to use atmospheric 8-bit track for the music selections. These have been difficult to find. These graphics were made for a request on the Knytt forums. 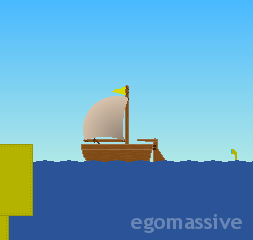 Someone was making a game involving a yellow submarine. Ooh! It’s yellow and it’s in the water. Notice the rivets, It uses a two-layered ground design technique. A hero needs a way to get to and from waterborne monstrosities. Especially since most adventurers can’t swim. I hope it doesn’t rust through! This is the red version. The distant objects are semitransparent to help show that some of the water between here and there is in front of them. ~ These graphics were made for a request on the Knytt forums. Someone was making a game involving a yellow submarine. This someone wanted a graphics set with the look of “An Underwater Adventure”, a Knytt Stories level by Nifflas, to construct their submarine. 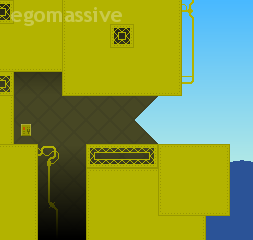 I loved the feel of that level, so I wanted to see if I could imitate it without ripping it off. ~ My end result was rather good I think. The originals by Nifflas had dark contact areas and light or pitch-black backgrounds. It was very mysterious and cold. Since mine had to be yellow, I settled on a medium darkness for my contact areas. This allowed the interiors to be very bright or very dark. One thing I don’t love are the eye-sering visuals of The Yellow Submarine movie. As a result the yellows in my tileset were muted. Now, I had to consider that the game designer requesting the graphics probably intended to homage the movie in some way. So, in an attempt to stay true to the movie’s visual assault, I added alternate purple interiors. ~ As far as submarines go, the graphics are a bit lacking. Submarines should have curved exteriors to help navigate the ocean currents and resist crushing pressure. 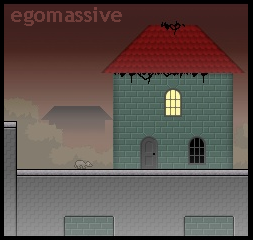 A curved shell would put a huge demand on tileset real-estate. Also, I wanted to make the set a little bit multipurposed. There’s no sense doing all this work for free if it can only be used for one game in a limited way. Finally in that spirit, I made a matching rust colored set. 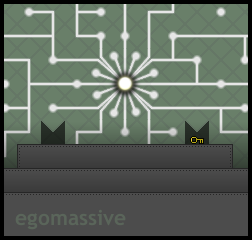 It’s always helpful to have a little graphical diversity yet matching style when building a game. A complete guide to the game A Knytt in Time by the author. ~ After the introduction, Juni heads right to find the Knytt Laboratory. Upon entering the door a cutscene plays. She jumps into the green ball. Then, jumps up to the switch to the left. Flipping the switch causes an explosion and fills the room with boxes! Juni walks out the door. ~ After exiting the lab, Juni discovers that the Volcano has not erupted and the world is not dying. But, when she goes back to Grandma’s house she discovers a frightened little girl. Now, more confused than ever, Juni heads right across town. Beyond the town lies a Forest. In the middle of this Forest Juni meets the energetic Nanna. Nanna explains that Juni has traveled through time. She instructs Juni to head into the tree house. After exiting, Juni discovers that Nanna has opened a cave for her. This cave leads to a system of root filled caves. There’s only one path that Juni can take. It eventually leads her to a room containing pink roots growing upwards. Juni picks off a piece, and heads back using the upper passage. Upon entering the tree, Juni drops the ingredient in the cauldron and succumbs to exhaustion. After waking Juni heads downstairs, swallows the remedy, makes her goodbyes, and heads right in search of more answers. ~ Right of the Forest is the East Mountain with the Hamster Cave leading inside. Exploring the cave leads Juni to a strange device mounted on a huge pipe. This Pipe-head is connected to a switch, which Juni flips. The device becomes permanently disabled and opens up. Juni jumps in and follows the pipe until she comes to another hatch. ~ Juni soon comes to a black waterfall. She jumps over it and enters a water filled cavern. These Wet Caves are dangerous and linear. They eventually bring her to a lab containing a device much like the one Nifflas had made back in the Knytt Laboratory. Finding herself without alternatives, Juni matches the symbols on the buttons to the symbols written on the wall. The force field lowers. Juni bravely enters the device and flips the switch. ~ The room bursts into flames. Something has gone wrong again. Juni starts to flee, but as soon as she moves the device kicks in and teleports her into a pit. Here, she finds a Climb Power-up which allows her to climb out of the pit. Juni continues to climb until she reaches the surface. Again the world is dying from the ash spewing from the distant Volcano. Juni is back in her own time. ~ Juni heads left across the Foothills of the West Mountain. She comes to a lifeless Ghostly Town. Then she reaches the sheer face of the mountain itself. Finding that the Gem Mines are a dead end for now, Juni climbs the mountain. Up high she finds another cave entrance which leads to another lab with yet another time portal. A robot patrols the room and another force field blocks the way. But, this time there is no solution on the wall. Following the conduit coming from the lab, Juni finds her way blocked by a laser. Just below the laser, she spies the combination to the force field. ~ Back in the lab, she quickly punches in the code while the robot patrols. Then she enters the portal, flips the switch, and smoothly teleports to the past. Relieved to have teleported without an explosion, Juni traces the conduit once again to find the power source. This time the laser is intermittent, so she times it and jumps by. Timing her way past a few more lasers she finds her second Pipe-head. Again she flips the switch, enters the hatch and follows the pipe to wherever it may lead. ~ The pipe leads to a man-made cavern. Juni climbs up the strange brown walls to find an even stranger blue bird. The friendly bird holds out a note for Juni which informs her that she needs to continue turning off Pipe-heads. The remaining Pipe-heads were on the Island, in the Forest, and in the distant Volcano. ~ Behind the bird sat a Double Jump Power-up. Taking this Juni was able to continue going up then right. Then, Juni saw for the first time the source of the black waterfalls and the destination of the large pipes. Juni had entered the Machine Room. ~ On the upper right side of the Machine Room, Juni found a time machine. She took it to the present and left through the door. Climbing up a shaft she spied a door about halfway up. This door led to a sewer which in turn led to a room with pictograms and graffiti. Juni realized the graffiti was a translation of the pictograms into the language she was familiar with. She quickly memorized them and moved on. ~ At the top of the shaft, Juni found a door. It led to her home town. She excitedly ran left to Grandma’s house. Once inside, Grandma told Juni that she could give her advice if she ever needed help. Then she gave Juni a device that would detect secrets and monsters. Juni didn’t know why Grandma knew all these things, but Grandma had been right about everything so far. Juni left her Grandma again, heading right. ~ The Forest was much taller than before, and much more dangerous. Juni stayed in the tree tops which was safer than the ground. 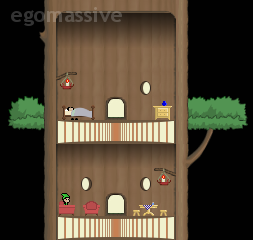 The original tree house was vacant at the bottom, but higher up she found new residents. When she climbed high enough she found a mother calling in through a window. Apparently, her son had barricaded himself in his room and would not come out until he was given Tree Berries. Feeling sorry for the boy’s mother, Juni decided to keep an eye out for these Tree Berries. ~ Coming back to the East Mountain, Juni climbed up the Hamster Cave. At the top she continued up and then right. She crossed a Big Bridge and wound up on the West Mountain. Getting back to the ground by the Ghostly Village, Juni entered the Gem Mines. Now equipped with the Double Jump Power-up, Juni easily entered the mine only to discover its depths were a confusing maze of shafts and girders. ~ First, she took the pit to the far right, and entered the door at the bottom. ~ Second, she exited the bottom door. ~ Third, she went down. ~ Fourth, quickly right past blue creatures that moved through walls. ~ Fifth, down and back left before a red creature could get her. ~ Sixth, staight through to the left. ~ Seventh; up, left, and down taking great care to avoid the round red thing with legs. ~ Finally, Juni could see the top of an Ancient Temple buried in the earth. In the Temple, Juni could go either right or left, so she chose one direction and made a complete loop. Back at the beginning she discovered the top was sealed and the floor was open. Jumping inside she found what appeared to be the entrance again. This time though, there was a spooky Eye. She collected it and headed up. ~ Now, Juni could see ghosts which was a little unsettling and a lot dangerous. She found that she had to make the loop in the opposite direction of the way she came, so she did. She took extra care to not step on the black floor tiles this time. Once back in the Gem Mines she left the way she came which was kind of repetitive. ~ Back on the surface and equipped with the Ghost Eye, she decided to investigate the town. In the large house a painting spoke to her. It offered it’s help in the form of a fire. Juni was a little skeptical, but she stepped into the fire. Instantly she found herself in the now ruined Knytt laboratory. Her hair was a little frizzy, but she felt it was worth the time she saved. ~ Juni returned to the Machine Room through the Clock Tower. Then, she teleported to the past. She exited the Machine Room through the bottom. She headed right through the very first pipe she had used until she was back in the Hamster Cave. She climbed out of the cave and entered the Forest. Just past Nanna’s house she found a way up into the tree tops. There she found some Tree Berries which she picked by pressing down. Then she headed back to the right. ~ Juni climbed up the Hamster Cave and over the mountains. Once on the ground by the Ghost Village (which wasn’t ghostly at all in the Past) Juni re-entered the Gem Mines. This time it was free of creatures but there were still plenty of mushrooms about. ~ Third, she went left. ~ Fourth, entered a door. ~ Fifth, exited the top door. ~ Seventh, entered the last of 4 doors. ~ Eighth, Pushed down until she was in the bottom left room and exited through the bottom left door. ~ Eleventh, entered the door in the top left. ~ Here Juni met a pale woman. She asked Juni to retrieve her Umbrella for the sake of her orphaned daughter. Juni agreed, and got a Yellow Key for her kindness. ~ Yellow Key in hand, Juni could open that yellow lock just out side. Beyond she found a Ghost Tunnel that was pretty tricky to get through. But, Juni believed in herself and she made it through. It led out into a Gorge. Juni climbed the cliff above her and soon found an Umbrella. She glided down to the right side of the Gorge and found a cave entrance on a large ledge. This led to the West Mountain lab. Going down from the lab Juni opened another yellow lock and exited the mountain. ~ Now equipped with the Umbrella, Juni Climbed to the top of the West Mountain. From here she jumped to the right, opened the umbrella at the top of her jump, and never let go of the ‘S’ key until she landed safely on the dock of the Island. On the right end of the Island she discovered that a key had been dropped down the well. Having gone through much worse, Juni fearlessly plunged into the well. ~ At the bottom Juni found the Blue Key conveniently lying on a rock. “Good thing it wasn’t in the water,” she thought. Finding her entrance path unreachable she followed a passage right, then up, and finally through a door. Now, she was in a storage room with a locked door. Upon exiting, all the fishermen realized they could go back to work. As soon as Juni either entered the left-most house or went down the well again, they would retrieve their gear and launch their boats. ~ Heading back down the well, Juni approached that blue lock she had seen. Beyond it laid another Pipe-head. The lasers on top were close together and Juni found they were easier to navigate if she walked. She turned off the device, but did not go through the pipe this time. Instead she headed back to the surface and headed right. Using the fishing boats as platforms she easily made it to her home town. ~ Juni visited the frightened little girl. Upon seeing the Umbrella she thought at first that Juni had stolen it. But then sensing the concern in Juni’s voice, the little girl realized that her mother… that something had happened to… It was difficult to think about. Instead the little girl thought about her tummy and how empty it felt. She told Juni she was hungry. She hoped Juni could find a way to fill the emptiness inside. Juni gave the girl a hug and went outside. She had to save the world first. Then, she’d fill the little girl with all the Tree Berries and Toast she could find. ~ In the middle of Juni’s home town was a pumping station. In the present it was condemned, but here in the past it was still operational. Inside, Juni found a passage at the back behind a stack of crates. This lead to a little room with old pictograms over modern switches. Juni remembered the cypher she saw in the sewers of the present; but even if she didn’t, she could match the pictograms to the symbols because there were similarities between them. Once the force field was down, Juni flipped the switch. Feeling her way back out she saw that the water had drained from the pumping station. At the the bottom of the empty pool Juni found a passage to the sewers. Heading left she found 4 tunnels leading to the Volcano. Any one of these would take her to the Volcano, so she chose one at random. ~ Some time later, Juni arrived in a huge waterfall basin outside the volcanic mountain. She climbed into the mountain and managed to get all the way through even if she didn’t have the umbrella already. Near the end there were two fire spitting flowers in the same room. Juni discovered that if she climbed up the cliff in the middle to the upper screen she’d find a secret passage that allowed her to bypass the second flower. Again she found a Pipe-head and again she switched it off. She entered the pipe and some time later arrived at the Machine Room. ~ Even though Juni hadn’t turned off all the Pipe-heads, she could reach the Main Breaker. She went to the top of the Machine Room, disabled the force field, and dropped down to the Main Breaker. Flipping it she completed her adventure, but she wasn’t satisfied with the results. So, she continued. ~ Finding herself by the teleporter in the Machine Room, Juni went to the present and climbed up to the surface. Here she headed back to the Forest, back to the Spoiled Brat (see part 8.) He smelled the Tree Berries (see part 11) on Juni and demanded she hand them over. In a moment of gratitude he offered her a Red Key he had stolen from Mountain Jack because he had thought it was one of those extinct Tree Berries Jack was always talking about. It sounds stupid, but the kid had never seen a key or a Tree Berry. Neither one were common in the Present Forest. Juni took the key and left before he changed his mind. ~ Juni went to the right side of the Forest and climbed the exterior of the East Mountain. There sat Mountain Jack. Juni showed him his lost Red Key, but he only insisted she jump over to the tree behind her and use it. Juni climbed up to the ledge above and double jumped as far as she could. She could have used the umbrella if she wanted, but it wasn’t necessary. The tree had a door, and beyond the door was a red lock. At the bottom was a cave door which led to a green button and a dangerous machine. The button had to be stood on for a certain total amount of time. Juni took turns between standing on the button and avoiding the machines projectiles. Eventually she made her way down to another teleporter. ~ With all the Pipe-heads disabled and the hologram missing from her inventory, Juni climbed to the top of the Machine Room. From there she turned off the force field and dropped down to the main breaker. She switched off the machine and was satisfied with the results, but she felt like there was more to do. So, she continued. ~ Juni found herself in the Machine Room. She teleported to the present and headed for the surface. Once outside she headed right to the Forest and saved on the spot in the screen with the sign reading, “Beware of too many traps.” Juni noticed a green glow coming from the Detector. When the seed shooting plant was taking a break, Juni ran past it and fell down a secret hole. It was Nanna’s Remedy Root Patch and in it was Nanna. Juni ate some of the raw pink roots by pushing down. The raw strength of the medicinal plant had an odd side-effect. Juni knew exactly where the flowers in her vision were. She left the root patch, promising to send Nanna help later. She went back to her Grandma’s house. ~ Outside Grandma’s house in the present, Juni noticed that the Volcano’s smoke was actually an updraft. Double Jumping from the ledge, holding down ‘S’, and opening the Umbrella right at the bottom of the updraft sent Juni into the screen above. Updrafts took Juni all the way to outer space. ~ In space Juni found a Space Station. She discovered that if she left any screen through the left or right side she would instantly enter from the opposite side. It was very hard, but she made it to the top. There, she saw the Hologram encased in a forcefield. She flipped a switch that she thought would release the Hologram. It did, but it also started the launch of the Space Station. Juni quickly grabbed the Hologram and used it to escape. ~ Having turned off all the Pipe-heads and obtaining the Hologram, Juni returned to the Machine Room. She went up top and disabled the force field. She dropped down the hole and switched off the Main Breaker. She saw the 3rd and final possible outcome for all her hard work. She said to herself, “I can totally get an A+ ranking.” She chose to continue if she had not. ~ This section attempts to clear up the plot for those still mystified. ~ The world is unstable. It has too much energy. At some point in history the large volcanic mountain erupts spewing ash. This slowly poisons the world, and soon the whole planet will die. In an attempt to prevent the eruption, Nifflas creates a time machine to send himself back in time to drain the world’s energy. ~ Nifflas builds a massive machine that reaches out across the land to drain the worlds energy from many different locations. Once the right amount of energy is drained the world will be in balance again and Nifflas can disable the machine. However, as time goes on he gets lost in other projects. He completely forgets about his mission. If the machine continues to drain energy the world will destabilize again. The volcano will erupt and the world will slowly die. ~ Thankfully, Juni is accidentally transported to the past. She is sent to the exact time when the machine needs to be turned off. Her Grandmother told her a machine was the source of the eruption, so when she starts finding pieces of the machine she turns them off. ~ In the bad ending, Juni is able to turn off the Main Breaker while energy is still being piped into the machine. Not only is the machine destroyed but an energy feedback instantly upsets the balance of the world. The volcano erupts and the land slowly dies. At the end Juni is her own grandmother. She sends herself to try and save the world again, hoping for a different result. ~ In the good ending, Juni disables all the energy collecting nodes before shutting down the heart of the machine. Nifflas now knows how dangerous a poorly powered time portal is and has lost his power source, the machine. Juni reveals that she intends to raise the orphan girl, thus hinting that she may only be her own adoptive grandmother. At the end in the present time, Grandma Juni and young Juni look out on a world saved. This is a time paradox because young Juni and young Nifflas will never go into the past to bring about this outcome. Apparently, this is a minor detail and everything is cool. ~ In the weird ending, everything is the same as the good ending except Juni is sent back to the present. The world is saved, but Grandma has concerns. It is revealed that Juni was supposed to stay in the past and raise her own mother. If she doesn’t there will be a major time paradox. Then, the paradox corrects itself with disastrous results. First I’ll give every location a name. 1.) Starting from the left or West side of the map you have the West Mountain with the Gem Mines below and the Ancient Temple below that. 2.) Next is the Ghost Town and Foothills with the Foothills Lab below. 3.) Island with the Well below and the Wet Cave at the bottom. 4.) Knytt Town with Sewers below, and the Machine Room below that. Above the flowers is the Space Station and the hologram. 6.) Forest with Root Caves below. 7.) East Mountain with Hamster Caves inside. 8.) Connecting the East to the West is the Big Bridge with the Gorge below and the Ghost Cave below that. Butter Toast: past below the Forest, take the Red Key pipe backwards. Capt. Stale: past step 1, visit T. Hunter’s grave in the Root cave after getting the Ghost Eye. Step 2, In the middle of the Wet Cave there’s a path up. Make sure to examine his treasure. ~ There’s a lot to see and a lot to overlook. This section attempts to point out all the things you might miss. Use the location guide in the Toast section. 1.) In the Ghost Village Past a little boy asks to hear a ghost story. In the present if you try to enter his house without the Ghost Eye someone says, “Go away.” After obtaining the Ghost Eye, Juni can enter the house to find an old man who is scared of ghosts. If the old man and the boy are the same person, then he has aged too much. 2.) If Juni returns to the where she met the woman’s ghost in the Gem Mines after obtaining the Umbrella she’ll find a single white flower. This is the same variety that grows outside Grandma’s house and nowhere else. Juni and Grandma are seen tending these flowers in different scenes. 3.) In the middle of the Ghost Tunnel Juni can see a skeleton in the water. This is below the Big Bridge where someone must have fallen. 4.) 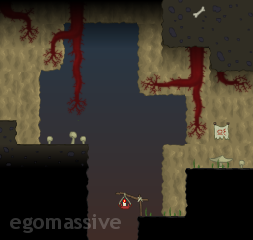 In the Gem Mines Past, One worker is trapped by mushrooms. In the present, Juni can see a skeleton and a ghost miner at the same location. 5.) You can find 3 miners in the past who talk to Juni, 1 in the present. 6.) The man standing on top of the West Mountain Past has different text before and after obtaining the Umbrella. 7.) Enter the center structure on the Island Past before getting the Blue Key and jump to the loft to see a man sleeping. Enter with the key to be scolded. After the boats launch he is gone and the stove is off. Enter in the Present to find a possibly dead guy. 8.) The Island’s store house unlocks, and the boats launch in both time frames when the Blue Key is found. Juni can glide to the Island in the Present before getting the Blue Key, but she’ll be stuck. However, it’s the only way to see the door say, “It’s locked.” in the Present. 9.) In the Past with the hologram, go in the sewers and head right. Go to the end and enter the door. Head up to find out why the Clock Tower always gives the same time. Head down to enter the Machine Room but on the wrong side of the force field. 10.) In the Forest Past at the top of Nanna’s tree house in another dwelling, Juni can see an exchange between a father and son. After obtaining the Red Key from the Spoiled Brat in the Present, Juni can see the same exchange repeated by the Spoiled Brat and his Mother. 11.) In the Forest Past, after obtaining the Run Power-up the young man in blue will tell Juni to “…walk sometimes.” Push down on the cat for a reference to Luminous City by Jeppo. 12.) After the boats launch in the past, the fishermen will mention other legends of Juni: Knytt on the Moon by Imaddo, An Underwater Adventure by Nifflas, Harvest by Farik. 13.) The sign in the Gem Mines that says “…Don’t eat the mushrooms,” is a reference to Don’t Eat the Mushroom by UnkleSporky. 14.) 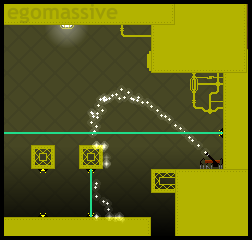 The Machine by Nifflas and many other levels are the inspiration for the machine in this level. Trek by Terv is the inspiration for making Nifflas a character in this level. 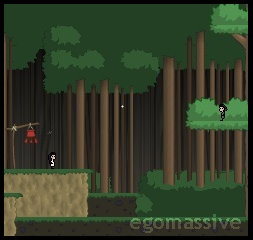 The Explore Challenge by LPChip and other levels inspired the use of teleporters. 15.) When the Double Jump Power-up becomes avaiable, go down before going up to see the strange bird blocking a switch. Afterwards, it is gone. The bird and the style of his cutscene parodies a secret found in a level by Nifflas. 16.) In the upper right of the machine room there is a lab area with a bed and an easy chair. At the beginning of the game it cannot be entered, but an old man’s head is visible in front of the monitor/behind the conduit. After any of the endings are unlocked, Juni can have a dialogue with him by walking back and forth. At the last comment, if Juni climbs to the top right corner she gets scolded. 17.) To reach the top dwelling of the tree house in the Present, double jump and glide from the East Mountain. 18.) As soon as Juni leaves the Space Station with the hologram, go back up to discover it gone. 19.) After getting the Good Ending, choose ‘Yes’ when asked if you found all the Toasts. You will get a rank of ‘F’ for lying. You can’t find all the Toasts without the Hologram, and you can’t get the Good Ending with the Hologram. 20.) It may be possible to skip most of the Root Cave Past by taking the secret passage you use to find Nanna in the Present. I’ve never managed it without the Run Power-up. It’s easy to do with the Umbrella. 21.) When you’re supposed to take your medicine (get the Run Power-up after fainting) try to leave the area. Juni will get scolded. If Juni does leave she’ll see a purple Bouncer blocking the cave entrance. 22.) After obtaining the Climb Power-up, the broken teleporter in the Foothills Lab gives a garbled message. It translates to, “Current Time: Present. Insufficient Power,” or, “Current Time: Past. Insufficient Power,” depending on Juni’s current time frame. 23.) Between the Forest and the East Mountain there’s a pit with a trap at the bottom. The pit can be exited through the wall on the left. This was added to avoid a forced suicide early on in the game. 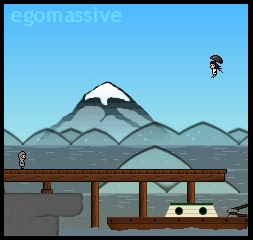 The only forced suicide in the level is by going to the Island Present before going there in the Past. 24.) Juni can only read T. Hunter’s gravestone before getting the Ghost Eye. His name stands for Treasure Hunter. Originally he was C. Copperpot, but I decided to restrict all references to the Knytt universe. Similarities remain between The Goonies and the hunt for Captain Stale’s treasure. It is unknown who buried T. Hunter or why they left the artifact. It is rumored that Captain Stale’s treasure was obtained at the cost of his crew’s lives. 25.) Actually there are outside references. The monitor in the Past Machine Room says, “Hello World.” The first lesson in most programming courses is to print “Hello World” to the screen. In the Present, the monitor makes reference to “The Hitch Hikers Guide to the Galaxy.” It is rumored that the Machine was using the world’s energy to compute this result. 26.) Check the treasure chest in the attic of the Island store house Past. 27.) Mountain Jack changes his Present dialog after the Forest Pipe-head is disabled. 28.) Head for the door before pressing the switch in the Knytt Laboritory to be scolded. 29.) Visit Grandma at the beginnig of the game. She’ll offer her advice but not the Detector. 30.) Before getting the Hologram, Present Nanna acts as though every visit is the first visit. After receiving the Hologram she reveals why. This is a Knytt Stories tileset I created to compliment the Mertynn tilesets made by Markham Carroll. 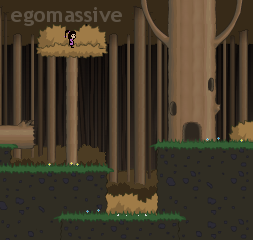 This shows how my tileset and gradient fill in the background to make a dense forest. The same screen redone with the gloomy brown foliage. Be careful of the pit, those are teeth poking up! Here you can see how the interiors shape up. Looks like those little Knytts live quaint and comfortable lives. For the underground I made what else but tree roots. ~ This is a Knytt Stories tileset I created to compliment the Mertynn tilesets made by Markham Carroll. I made most of the graphics in this set for A Knytt in Time, my first Knytt Stories level. The complimentary graphics were spread across several tilesets which catered specifically to my level’s needs. I liked the Mertynn parts I made so well that I decided to release them as a set for other Knytt Stories level authors. After gathering them all together there was still room left. So, I filled the rest of it with more goodies. ~ Of course, this couldn’t be released without Markham Carroll’s blessing. I’m happy to say he gladly agreed to it. It’s usage rights are for Knytt Stories levels only. Edits are not allowed. Markham and I, egomassive, should be credited where it is used. Thanks.